The first five volumes of the new Murty Classical Library of India (photo 1) were released in January from Harvard University Press. The hope is to publish 500 volumes over the next century, which will reveal to the world a “colossal Indian past” of multilanguage literary history from as far back as two millennia. 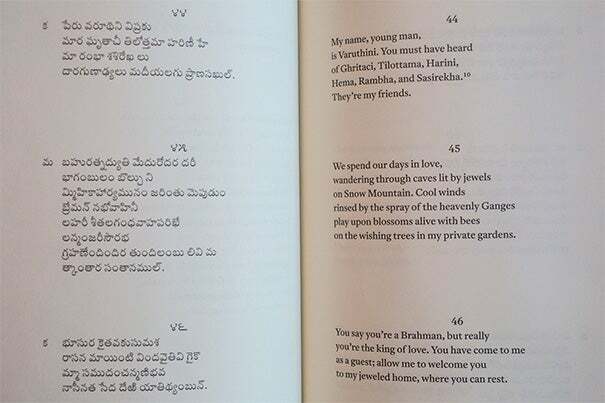 A detail from Volume 4, "The Story of Manu" by Allasani Peddana (photo 2). This is the first time it has appeared in English. In the spring of 2009, Sheldon Pollock ’71, Ph.D. ’75, the Arvind Raghunathan Professor of South Asian Studies at Columbia, was sitting in a Cambridge café with Sharmila Sen ’92, executive editor at large at the Harvard University Press. “I took out the proverbial napkin,” said Pollock. The two sketched out what would be needed to publish his longtime dream: a series of volumes on classical Indian literature. Why not 500 books over the next century, they thought: poetry, prose, philosophy, and literary criticism — and later science and mathematics? These largely unseen works, some of which date back more than two millennia, had in the last century shrunk to a canon available almost solely in Sanskrit. Such a visionary series could bring to light again the heart of the longest continuous multilanguage literary tradition in the world, one that represents the most languages, at least 20 of them. The many languages of the Indian subcontinent, both living and dead, are a musical linguistic litany that includes Sanskrit, Prakrit, Pali, Marathi, Sindhi, Hindi, Tamil, Persian, Telugu, Urdu, Panjabi, and Bangla. Why not a new series? A model format was already in place. The Loeb Classical Library, launched at Harvard University Press in 1911, now comprises more than 525 handsome volumes in Latin and Greek, along with solid English translations on facing pages. “Back when I was 19 or 20,” said Pollock during a phone conversation, “I very much thought a classical library for India along the lines of the Loeb was a terrific idea.” He called the series an object of “wishing and longing” for decades. Sen remembers the same day, when wishing and longing was sketched out on that café napkin. “Shelly told me about the idea,” she said. “I liked it very much. It was exciting to us both.” Sen, who was raised in Kolkata and has a Ph.D. in English from Yale, was aware of a publishing precedent, the Clay Sanskrit Library published by New York University Press, which stopped at 56 volumes. Murty is the scion of a wealthy business family in Bangalore, India, with a history of educational philanthropy. His father is the information technology industrialist N.R. Narayana Murthy, co-founder of Infosys. His mother is the polymath computer scientist, social worker, and author Sudha Murty, India’s best-selling female author, with 136 titles to her credit. Rohan Murty, now on leave as a junior fellow in the Society of Fellows, knew about the Loeb series, of course, said Sen, and wondered why there wasn’t a version for Indian literature. During his graduate studies at Harvard, Murty took a break from distributed computing and opportunistic wireless networks to delve into courses in the Department of South Asian Studies with Parimal G. Patil, professor of religion and Indian philosophy. Then came the conclusion of what Sen called “a series of happy accidents,” beginning with that napkin sketch. In 2010, Murty founded the Murty Classical Library of India with a gift of $5.2 million to Harvard. The first five volumes of the series came out in January. (Pollock, general editor of the new library, is part of a four-person editorial board.) Within the next century, insiders hope that the MCLI, as they call it, will publish at least 500 titles. The cursive Indic fonts appear fanciful and fascinating to the average reader of English, resembling a decorative collection of lexical pictures. But Pollock thinks that a new generation of Indian-language scholars will emerge as they are intrigued by the appearance of these pre-modern languages in their original scripts. He said that learning the scripts and translations will be helped by the ease of reading from one side of a page to the other. In a future electronic edition of the works, said Pollock, a scholar will be able to “toggle between scripts,” smoothing the way to compare one old script to another. The volumes, present and planned, include a lesson in geography. The languages reflect places beyond modern-day India. They represent an area far larger than Europe — stretching west to Afghanistan, east to Myanmar, and north and south from Nepal to Sri Lanka. “It’s completely transformative,” said Patil of the new series. “It makes it possible to take courses in classical Indian literature” as readily as courses in the classics of ancient Greece and Rome. Since the first books appeared, Pollock and Sen have attended a series of events to launch the new library, including three in India and one in London. The fifth and final launch event is slated for Thursday (March 5) at the Harvard Art Museums. “Shelly’s old professor will be there,” said Sen. That is 79-year-old Glen W. Bowersock, who Pollock recalled canceled a class during the antiwar tumult at Harvard in May of 1970, after reciting a sympathetic line from the historian Tacitus. “These works are not just for scholars,” said Sen. They follow the model established for such libraries by James Loeb himself, Class of 1888, who wanted to be a professor of classics. Because he was Jewish, the doors to academe were closed to him in that era. Instead, Loeb funded the classics library that bears his name and was designed to appeal both to scholars and the public. “He wanted this knowledge of classical literature to extend beyond university walls,” said Sen. The same will be true of the MCLI, she added. Volume 2 is “The History of Akbar,” the first of seven planned volumes. It’s a grandiose 16th-century rendering in Persian of the life of the Mughal emperor Akbar, who presided over an era of religious tolerance. His bloodline, author Abu’l-Fazl asserts, began with Adam; Akbar’s birth was accompanied by miracles; and his life was suffused with divine light. (“That Akbar is related to the sun,” he wrote, “is obvious.”) This work, a model for historical prose in its day, has appeared in English translation only once. Volume 3, the most slender, gets a lot of attention for being a translation of what is likely the first collection of women’s writing in the world. “Therigatha: Poems of the First Buddhist Women,” written in the Pali language by elder Buddhist nuns in the fourth century B.C.E., is also the oldest work among the first five volumes. Pali, the ancient language of Buddhism, disappeared from mainland India in the sixth or seventh century, along with manuscripts in the original Indic script, said Pollock. Pali works survived in other languages and are still studied in Buddhist communities outside India. In the West, these poems are commonly printed in Roman typeface. Many had been widely translated, but “this is the first translation of this book that really works,” he said. Holding the Surdas genre together were tales of Krishna, the cowherd deity of Hindu tradition. He is one of many figures familiar to Indians in everyday storytelling, though largely unavailable in printed literature. The MCLI, said Patil, will fill in gaps between common imagery in India and the works that gave rise to it.